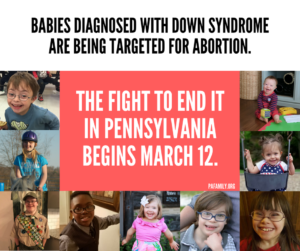 New legislation, House Bill 2050 & Senate Bill 1050, would improve Pennsylvania by prohibiting by law an abortion of any child solely due to a diagnosis of possible Down syndrome. A critical action at this stage for the legislation is showing our support by attending the upcoming rally. Along with the lead sponsors – Speaker of the House Mike Turzai, State Representative Judy Ward, State Senator Scott Martin – help us show our elected officials that Pennsylvania supports this effort. Join arm-in-arm with other advocates by attending in-person. Hear from Karen Gaffney, world-renowned champion for disability rights. For more on Karen Gaffney, click here. If you plan on attending, RSVP on Facebook. 2) Share details online about the rally. Event Flyer: Download and print. Click here to share the Facebook event page. 3) Encourage your church to announce the rally. 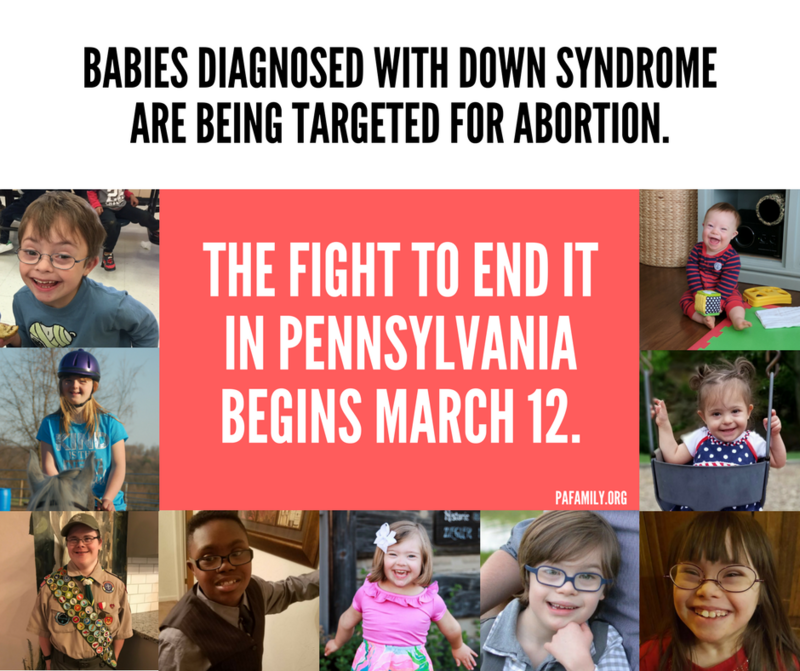 Rally in Harrisburg Monday, March 12 (Capitol Rotunda, 2:30pm) – New legislation (House Bill 2050, Senate Bill 1050) would improve Pennsylvania by prohibiting by law an abortion of any child solely due to a diagnosis of possible Down syndrome. The lead sponsors of this legislative effort – Speaker of the House Mike Turzai, State Representative Judy Ward and State Senator Scott Martin – are formally announcing this legislation at a rally in the State Capitol Rotunda on Monday, March 12th. Opponents are already mobilizing against this common sense legislation – all the more reason why we want to fill the Rotunda with people who support this effort. Questions? Contact PA Family Council at 717-545-0600. 4) Connect with your elected officials. Find contact information for your state officials: click here to use our Find Your Legislator tool. Please pray for this upcoming rally. Pray for Karen Gaffney and the elected officials involved. And pray for the success of this legislative effort.